Review by Andalorium on 1/5/2017. 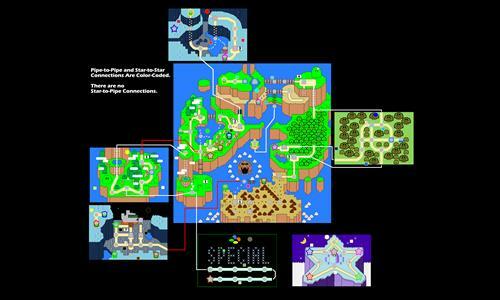 Nice job on capturing the world of Super Mario. Review by Zephyrum on 1/6/2017. Aesthetically pleasing, despite hardly playable. Very good job. Though I think it would be better if Pipes and Stars didn't *connect* to the other hand, but instead, were the SAME TERRITORY as the other end. Maybe that's just me. Also, Yoshi's House and Yoshi's Outhouse would be an ideal merge, too. The Castles, and maybe Ghost Houses and Switch Palaces too, would be better as standalone 1-territory-1-income bonuses, and probably the same about the TSA rather than just making it part of Donut Plains West. Pretty good to revive my childhood, though. Makes me want to run the ROM I have on my PC again. :) The map is a perfect clone of the original in map-art, looks amazing and as easily navigable in WL as it is in-game. 5/5. Review by Gunk on 1/27/2017.